J.M. Snyder » Hard at Work Box Set now available! Hard at Work Box Set now available! 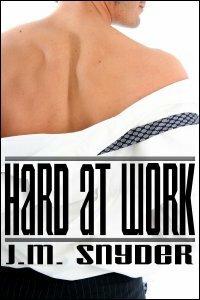 The next box set I’ve released on all distributor sites is called Hard at Work, which combines four novelettes into one collection. What’s a novelette, exactly? Anything that falls between a short story and a novella, so somewhere between 10,000 and 20,000 words in length. And the four stories in Hard at Work are all smokin’ hot! Double Standard: Jeff has lusted after Evan since the moment his new employee first stepped into his office. Evan is just as interested. The only problem? The little paragraph in the employee handbook that states they can’t get together because Jeff’s the boss. Then Jeff finds himself working late one evening with Evan, who decides to take matters into his own hands regardless of what the manual says. The Tattooed Heart: Chris is a tattoo artist who coerces Lee to stop by after hours for free tattoos. Lee’s body is a shrine to Chris’s artwork. Every tattoo is a custom creation by Chris, whom Lee has loved for years. What will it take for Chris to realize the lover he’s looking for has been sitting in his tattoo chair all along?